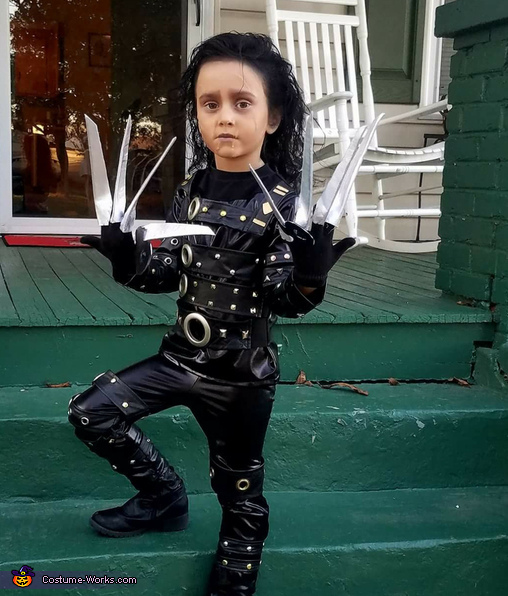 My 4 year old daughter has wanted to be Edward Scissorhands since the day after Halloween 2016. She was beetlejuice that year. She is very into the Tim Burton characters, so I had to make it happen. We had to get her costume custom made so we hired a woman to do the job, and it came out perfect. My daughters name is Charlie, and she doesn't only pick out these crazy costumes, but loves to act out the character. She did great! It took 2 hours to do her makeup (with breaks), but she was patient and couldn't wait to get to a mirror. I used liquid latex and cotton for hers scars, and bare minerals make-up for the rest. Used black hair spray for her hair. She was a big hit! !